Here are a couple of easy cards. Two Coordinating Patterned Papers, trimmed, inked, and adhered to card stock. 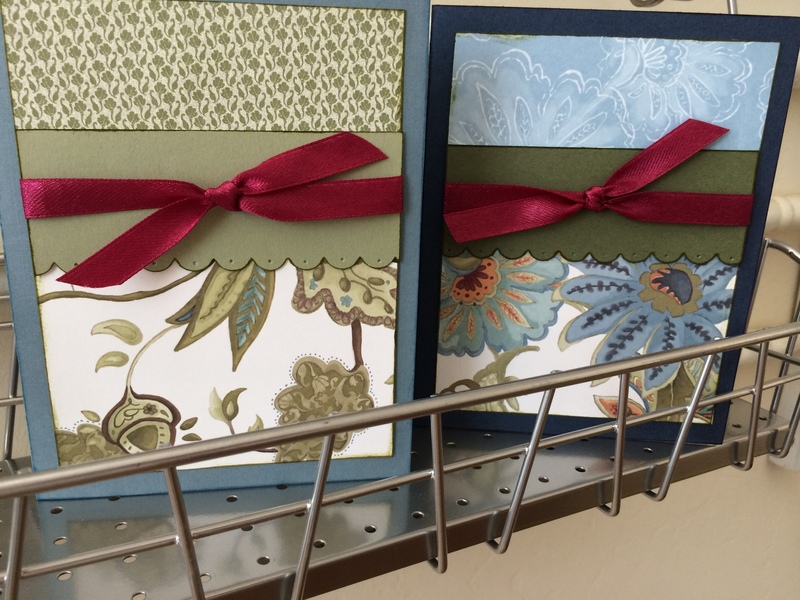 One solid color card stock, punched with scallop border, pierced along the scallops, wrapped with a ribbon, and layered over the place where the bottom layers were joined. Done. These went together fairly quickly. I made about six of them to give as a gift. Because the card stock was dark, I also adhered a piece of white inside to make it easier to write. I can’t say for sure what the card stock colors/brands were. I think the greens are from Stampin’ Up (Certainly Celery, and Always Artichokes). The blues are an unknown brand similar to Brocade Blue (retired) and Night of Navy. The patterned paper is retired (Paisley Petals from Stampin’ Up!). The ribbon probably came from Michael’s. Feels good to make good use of some things from my hoard (I mean supplies). Check ebay for retired Stampin’ Up! papers.